Basecamp will be 20 years in business this 2019. Basecamp 3, its latest version, was introduced in 2015. Nearly 2 years in the making, it offers many new features and improvements. Companies of all sizes and businesses of all types continue to rely on this project management and collaboration tool. And it continues to add new features and improve on its existing tools, making it easier for customers to complete their projects successfully. Late last year, users are able to sort their message boards in more ways. Also, they can collaborate more easily with the latest Android app. For a great reporting and exporting tool for Basecamp, we recommend you use our own tool Bridge24 for Basecamp. The Basecamp 3 Message Board is the central place for teams to post feedbacks and gather updates. It helps keep entire conversations about a specific topic in one place, on a single page. Since the beginning, Message Board posts are sorted in a way that new ones appear at the top, and the older ones below. Due to customer requests, two more ways of sorting are added for flexibility. Aside from the sort order by original post date, users can now sort Message Board posts by the latest comment, or sort alphabetically. Sorting by original post date is still the default setting. To change the sort order, from the menu, go to the upper right corner of the message board, and click the 3 dots (more options) button, then select the ‘Sort message by’ option. Sorting by latest comment displays messages with new comments first. This sorting is preferable if users want to keep those with the most active discussions on top. Sorting alphabetically displays messages based on their title. This sorting is handy when teams arrange the Message Board like a table of contents. 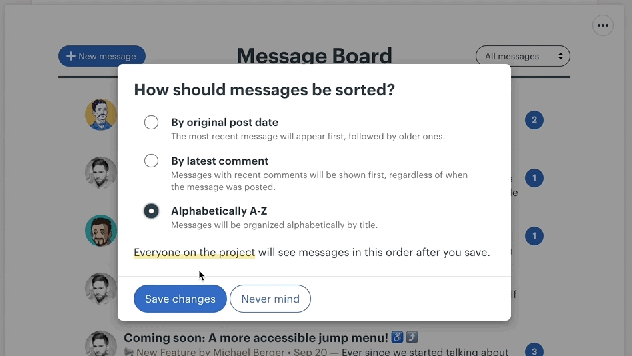 It is important to note that whatever sorting order users choose for the Message Board, it becomes the default setting for everyone on the project. The same sort order will be used on the Message Board posts on the project’s home screen. However, each project can have its own setting. In Basecamp for Android version 3.12, they introduced additional shortcuts for quicker actions and collaboration. For instance, users can now swipe up on the Home screen to reveal new action buttons. From the screen, they can now add a to-do, post a message, add an event, or upload a file. Of course, it is possible to do this also using the big green Add button. But if they are just browsing projects or the Hey! menu, swiping up is the easier action to do. 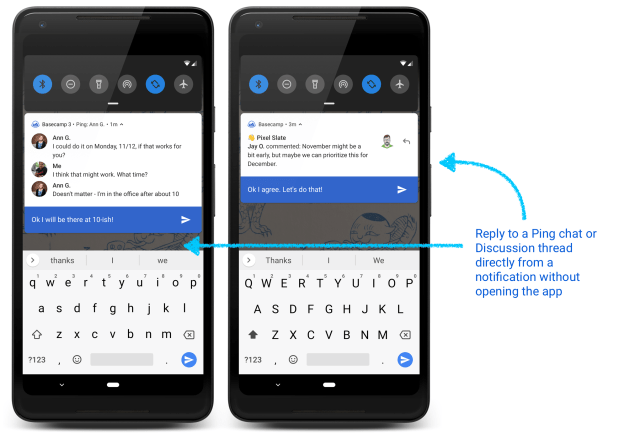 The latest Basecamp 3 for Android includes an improved interface for commenting on messages. Users can now format their comments using bold, italic, and bullets. Moreover, they can select multiple images to form an image gallery. They simply need to tap the paperclip icon, and select images one at a time in the right order they want the images to appear. Then tap ‘Upload files,’ and the images will be together in a group. They can add or edit captions to the images as well. 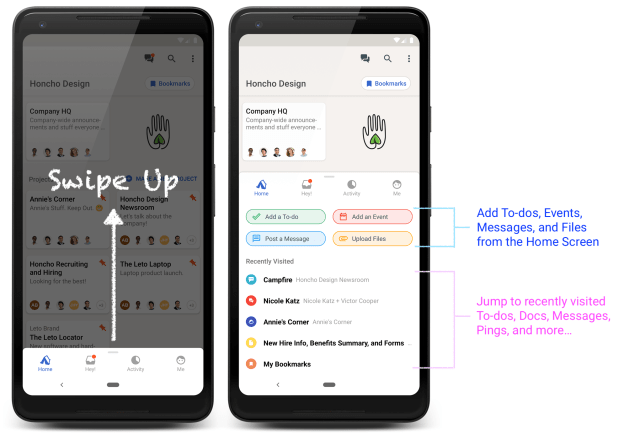 Users with phones running Android 8.0 or higher can take advantage of the ability to have Basecamp conversations without opening the app. When a Ping or Message notification appears, they can reply directly inside the notification. They will even see a running history of messages in that conversation. 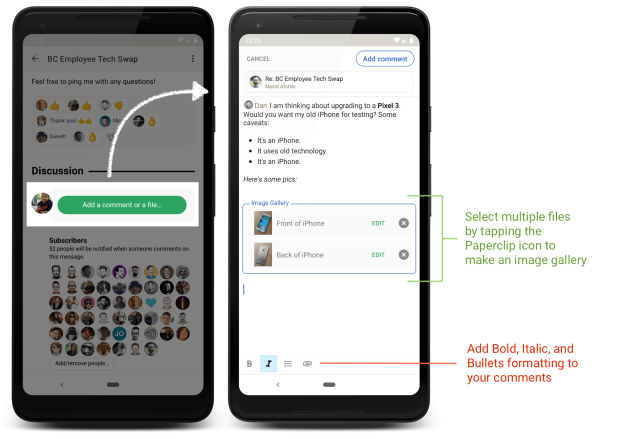 Basecamp 3 continues to provide users helpful tools and improve on existing features that will help everyone communicate efficiently. To learn more about these improvements and other updates, go to their Twitter, Instagram, or YouTube page.